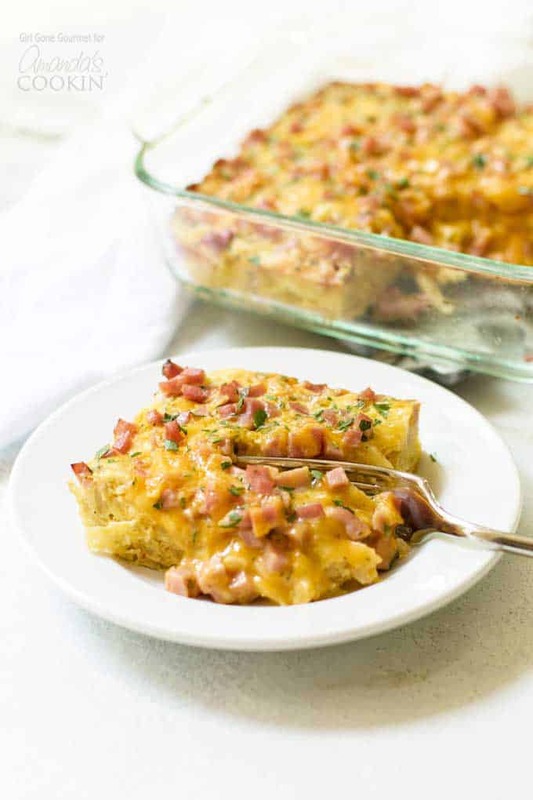 Breakfast Casserole with Ham and Cheese: an easy, cheesy casserole. This easy breakfast casserole with ham, cheese, and potatoes is a fulfilling way to start the day. This breakfast casserole serves four and is simple to make. Casseroles are perfect for weekend mornings or holiday mornings, you just can’t go wrong! While our amazing homemade cinnamon rolls make a delicious breakfast, this ham and egg casserole doesn’t require any rise time! Until recently, I thought of breakfast casseroles as a weekend meal perfect for serving to a crowd. Recipes like my Ham and Broccoli Strata or Tex-Mex Breakfast Bake are great examples! This simple breakfast casserole with hash browns and ham is so easy you can make it during the week. Seems crazy, right? It doesn’t have to be! With a little planning, a hot breakfast casserole could become your new favorite way to kick off a Monday morning. And when I say “planning” there’s really not that much. Prepping the casserole ingredients takes all of ten minutes, but it does need 30-40 minutes in the oven. A little prep helps so the casserole is baking while you and your family are getting ready for the day. Too much of a stretch? Well, in that case, bake it the night before and refrigerate overnight. You can quickly warm up individual slices the next morning. Either way, the hands-on time is almost nothing. I fondly remember my grandma called this an egg bake with ham. It was her favorite Christmas breakfast! Every Christmas morning we could count on this delicious meal. She always saved leftover ham from Easter dinner and served her famous ham and cheese breakfast casserole the next day. It was perfect for feeding a crowd before they headed back home. 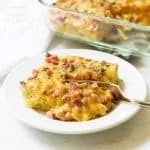 Using diced ham and store-bought hash browns makes it very easy to prepare this breakfast casserole with ham and cheese. 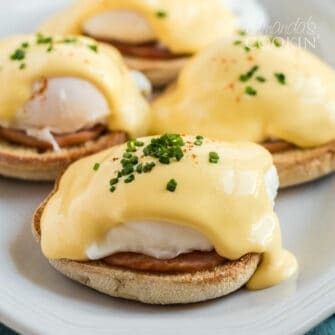 You’ll need just one bowl to prepare the eggs and everything else is layered in a baking dish. Hash browns: Look for bags of refrigerated hash browns. Using pre-seasoned ones cuts down on the work. If you want to customize the flavors buy plain ones and put your spice cabinet to good use. Cheddar cheese: I prefer to buy blocks of cheddar of cheese and shred them myself using a food processor. Do this the same day you buy it and keep it in a zipper bag in the refrigerator. I find it melts better, but pre-shredded cheese works and makes it even easier. Diced ham: Look for it in the deli section at the store. The egg mixture has a little milk, salt and pepper, and some chopped parsley. Bell peppers are not included here, but they would be a great addition! 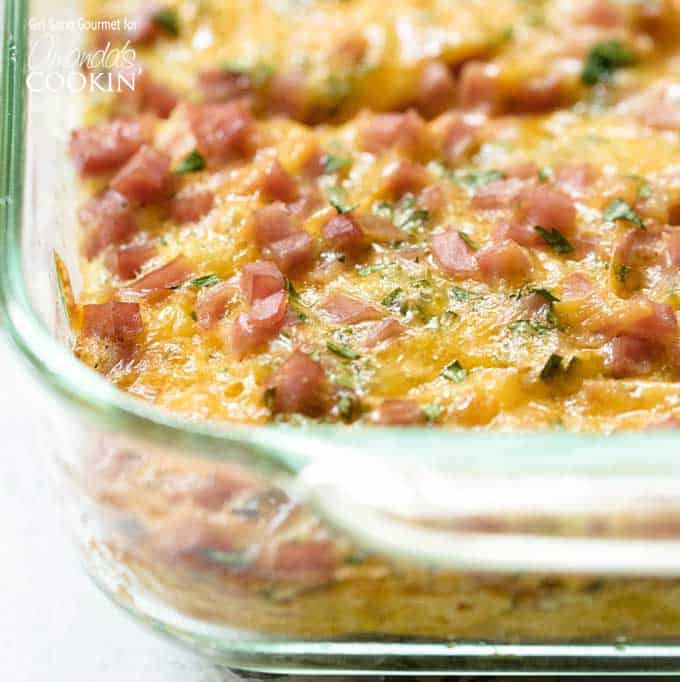 This easy breakfast casserole with ham and cheese is so simple to make. Once you cut into the delicious layers and melted cheese you’ll want to make this your go-to breakfast every week. For more popular breakfast recipes, try this blueberry breakfast cake! Favorited by many for obvious reasons, this breakfast cake is perfect alongside a cup of joe or tea. Or for a more traditional breakfast, this Sausage Gravy is perfect for making biscuits and gravy at home- from scratch! If you’re typically in a rush in the morning, you’ll want to check out this coffee smoothie. Packed with whole grains, fruit, protein, and coffee this smoothie will leave you feeling energized and ready to conquer the day. Oh, and it’s ready in 5 minutes! If you’re trying to cut back on fat, try our turkey hash brown breakfast casserole. 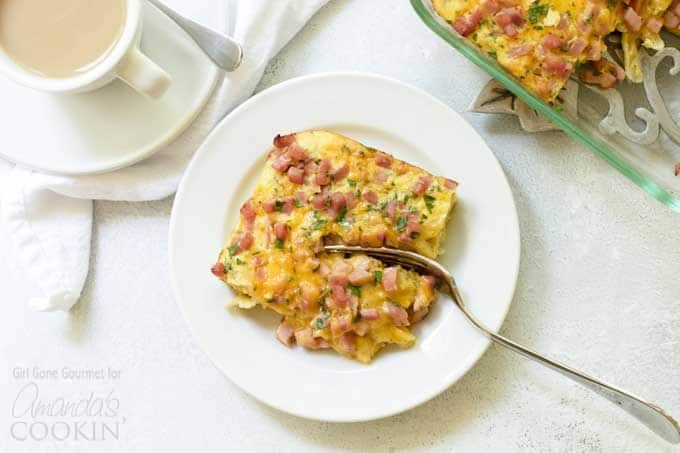 This easy breakfast casserole with ham, cheese, and potatoes is a fulfilling way to start the day. Preheat oven 350 degrees. Spray an 8x8 baking dish with cooking spray. Place the hash browns in an even layer in the baking dish. Top with the cheese and ham. Beat the eggs with the milk, seasonings, and parsley in a medium bowl. Pour the egg mixture over the ham cheese and potatoes. Bake the casserole for 45 minutes or until the eggs are set. Let stand a few minutes before slicing. Look for refrigerated shredded hash browns at the grocery store. If you can't find them you can use frozen, but thaw them in the bag before using. This post originally appeared on this blog on Aug 25, 2017. Wondering if leftovers can be frozen and reheated at a later date. I am living alone and maybe would like a couple days in a row but not every day until it is gone. It does sound very yummy! I make one very similar and can attest to the fact that it is delicious. You have also reminded me that I should put one in the fridge for breakfast!